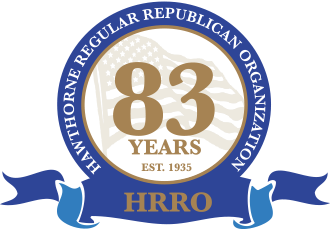 We have enjoyed 83 years of service to the community and have contributed to the Quality of Life issues, Educational issues, and keep our community and our membership constantly updated on the issues that affect all of us. Our organization structure is comprised of 16 Board of Directors. We meet on the first Monday of every month except for July & August at the Van Dyk Place at 7:00pm. The Executive Board meets quarterly. Our meetings are attended by our membership as well as by the governing body, Mayor, Council, PBA and most of our town’s dignitaries. We offer refreshments and/or food at our selected meetings. We invite all of you to be our guest if you choose to join, must be of voting age and be a registered Republican. Our future is based on the past foundation. We are very proud to be a progressive political club and sponsor High School Scholarships, Memorial Day Float, monthly membership socials and yearly Installation Dinner Dance. B.O.E., Planning Board, Board of Adjustment, Economical Development, Environmental Commission, Board of Health and much more. Promoting the health and safety of all our residents is our chief concern and we advocate strong implementation of environmental regulations to safeguard the public’s good. We are also advocates toward property values, quality of our schools, anything and everything that affects all residents.